It’s that time again! October is Queer Romance Month. Last year’s event was amazing: uplifting, inspirational, occasionally heart-breaking and full of lovely posts, people, stories and books. Looking at the list of contributors for this year, I’m sure there will be more of the same so I really encourage you to go check it out every day. Even if you think you might not be interested in romances that aren’t about one man and one woman falling in love, you might be surprised. But back to QRM. I made a cake last year (because what’s a celebration without cake?) and this year my friend Alexis Hall asked me to do an official post. I was super flattered, but a little unsure of what to say. So I just said what I thought, which is that QRM is the perfect opportunity for someone like me to learn and be grateful for the work everyone is doing, while being mindful that this is one time when I really can do more listening than talking. You can read my post here. But everyone else’s posts are wonderful so don’t just read that one. 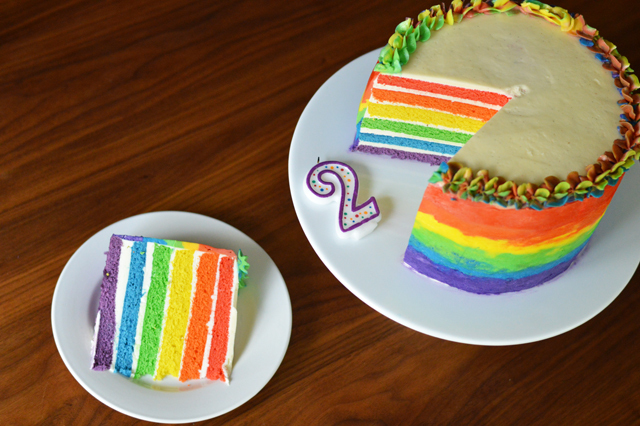 And since I know some of you are just here for the cake, that rainbow frosting? Totally fun. I spread on a small spatula-worth of each color, one on top of the other and smoothed it over with a large off-set spatula. It created this ultra-nifty looking oil pastel type dealie. It wasn’t quite the look I was going for, but I’ll take it! Experimenting is always fun. So. Queer Romance Month! Go! Read! Buy books! You won’t regret a single moment.